I recently attended a conference where several senior leaders of The Church of Jesus Christ of Latter-Day Saints spoke. Each talk was good. But the talk given by Bishop Gérald Caussé especially appealed to me. Growing up in the south of France, Brother Caussé's family made an annual trip to the Bern Switzerland Temple. It was a tedious two-day drive each way, but his family cherished the week they spent at the temple each summer. After marrying, Brother Caussé and his wife lived in Paris around the time that the Frankfurt Germany Temple was dedicated. They were then able to make trips to the temple in a few hours. The family enjoyed the overnight trips the local congregation often made to the temple. When Brother Caussé was called to the First Quorum of the Seventy in 2008, he and his family relocated to Frankfurt. Living only 15 minutes from the temple, his family discovered a whole new set of challenges to attending the temple. Although the temple was convenient — or perhaps because the temple was convenient — obstacles, including the normal busy-ness of life constantly arose to regular temple attendance. Two years ago when he was called to the Presiding Bishopric, Bishop Caussé and his family moved into a home that is very close to the Draper Utah Temple. The temple is prominently visible from the living room window, a view he very much loves. Bishop Caussé caught my attention when he said, "I never want to lose the ability to see the temple through my little boy eyes." The Presiding Bishopric has responsibility for church facilities, including temples. I can see how dealing with maintenance on the church's 141 temples could make these structures seem like other buildings that have many similar issues and needs. But Bishop Caussé wants to continue to see these buildings with the same kind of reverence and awe with which he saw the temple in Switzerland as a child. Not as something magical, but as something magnificently sacred. The Ogden Utah Temple holds a special place in my heart. I was a child when the temple was first dedicated. It was in this temple that I was first baptized for the dead, where I had a job as a groundskeeper for a few months before leaving on my mission, where I was endowed, and where I was married and sealed to my eternal companion. 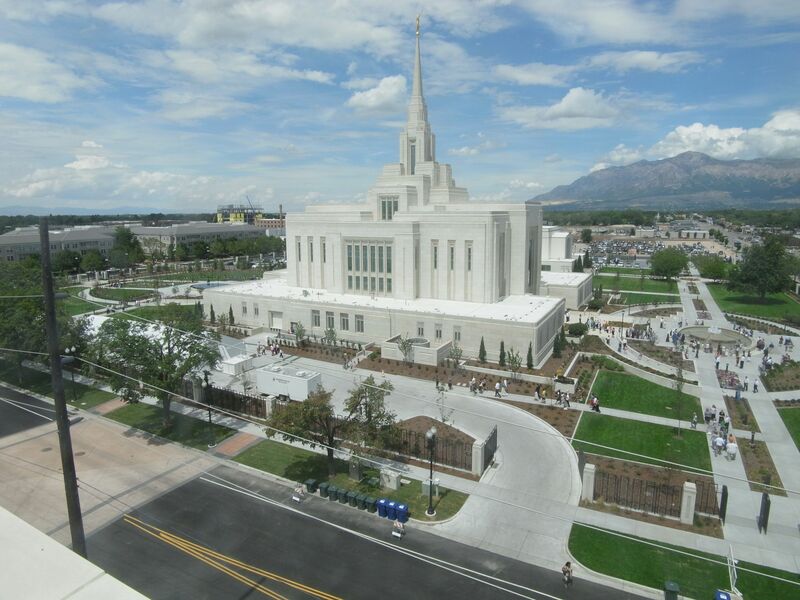 The temple was recently rededicated following a major renovation that lasted 3½ years. During the temple's long closure, we attended the Logan, Brigham City, Bountiful, Salt Lake, Jordan River, and Oquirrh Mountain Temples. It was interesting to watch the conversion of the old Ogden Temple to a new and arguably more beautiful edifice. But going without our nearby temple for several years engendered in us greater appreciation for the structure so that we greatly anticipated its reopening. A childhood friend acted as the superintendent on the large renovation job. He recently debunked some of the faith promoting stories that have been repeated surrounding the project. He said that some of these stories are "beautiful" but are also "absolutely not true." The job was fraught with many difficulties, including quarried and finished pillars being held for ransom in China, the dome in the Celestial Room being originally built too small, the oxen for the baptismal font being built too long, hundreds of specialized light fixtures having to be fixed on site by the manufacturer, the need to tear out finished stonework when a plumber inadvertently left a test ball in a pipe, serious water table issues, and scheduling challenges. There were a number of minor miracles too. But the greatest miracles my friend saw were positive changes in the lives a few people connected with the project. We are very happy that the Ogden Temple is open once again. Its beauty is fitting for the ordinances and covenants that are eternally bound within the structure. 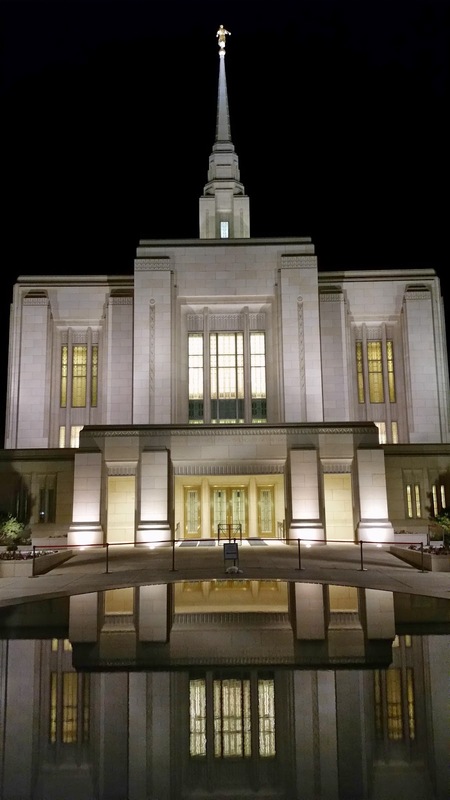 I was definitely looking at the temple through my little boy eyes the night I captured the photo below with my phone. Like Bishop Caussé, I hope to never lose my ability to see the temple "through my little boy eyes," seeing the wonder and sacredness that is obvious to those that are willing to come unto Christ as a little child (see 3 Nephi 11;37-38, Matt 18:2-4). The old saying goes that money can't buy happiness. Maybe not. But in our modern era money is inextricably tied to human happiness. Still, the relationship between money and happiness is somewhat complex. Few rules of thumb hold true across all demographics when it comes to this enigmatic relationship. But as reported in this Wall Street Journal article, one persistent rule is that giving money away tends to increase happiness almost more than anything else that could be done with it. Especially when compared to lavishing it on oneself. This even holds true for the very poor. This is one reason that people are drawn to give to panhandlers even when they suspect that the funds might be ill used and even when authorities ask people not to give to panhandlers. Givers feel happier for having given. In a way, panhandlers offer increased happiness to the donors, regardless of whether the recipients use the funds for self destructive purposes or not. This may help explain why family members sometimes continue to give to n'er-do-well relations when rational indications are that it will likely harm the recipient in the long run. Another general rule is that "debt has a detrimental effect on happiness." While "savings and financial security tend to boost [happiness]," "debt is more potently bad than savings are good." In other words, $100 of debt reduces happiness more than $100 of savings increases it. Says one researcher, "From a happiness perspective, it’s more important to get rid of debt than to build savings." So, it would seem that getting/staying out of debt and giving money away can increase your happiness regardless of how rich or poor you are. Beyond this the relationship between money and happiness becomes more obscure. Having more income does tend to increase happiness up to a point. But researchers have found that "happiness did not rise after a household reached an annual income of approximately $75,000." "The bottom line: When you don’t have much money, a little extra can go a long way, because you have more essential needs to fulfill. As you accumulate more wealth, however, it becomes more difficult to keep “buying” more happiness." Researchers class life satisfaction separately from happiness. In general, satisfaction increases with income. Feeling satisfied can enhance happiness, but satisfaction is not itself happiness. Another interesting finding reported in the article is that buying experiences produces greater happiness than does buying material goods. But people tend to think that buying stuff will make them better off than buying experiences. I understand how this works. The prudent side of me says that an experience like a vacation will quickly be over, while some material good will likely last far longer. This is true, but the article explains that we soon get used to our new stuff and we take it for granted. This is called "hedonic adaptation." Experiences, on the other hand, remain special to us for much longer, often due to sharing experiences with others. Regularly revisiting these memories helps define who we are. Getting enough money to meet necessities. Saving and working toward financial security. Taking care to buy worthwhile experiences (while avoiding debt). Being judicious about acquiring stuff. Once each month LDS congregations around the world hold a fast. Those that are physically able are asked to fast for two consecutive meals and then donate at least the value of those meals for the aid of the poor. As part of this effort, congregations hold a fast and testimony meeting, where "members who feel prompted ... share (or "bear") their testimony with the" congregation. Fast and testimony meetings can be powerfully uplifting and spiritually fulfilling experiences. However, given that anyone can get up to testify, and given that "The Church of Jesus Christ of Latter-day Saints is a place for people with all kinds of testimonies" (per Pres. Uchtdorf in October 2014 general conference), unscripted testimony meetings can have moments that are comical, awkward, or downright strange. Indeed, anyone that has attended more than a handful of LDS testimony meetings can probably relate episodes where less than perfect people have provided for less than ideal worship experiences. In our misanthropic moments, some of my acquaintances and I have been known to refer to these kinds of fast and testimony meetings as Open Mic Sunday. One of our family's fondest memories of such an incident occurred one Sunday that I was unable to attend church due to an emergency. That left my wife to manage three young children. She left the two older boys quietly drawing in the chapel while she retreated to the mother's lounge to nurse the baby. She soon was surprised to hear Son #1 speaking via the audio piped in from the meeting. Although he is characteristically an introvert, Son #1 went on at great length about many things that had little to do with spiritual matters, offering multiple childish insights that elicited hearty laughter from the congregation. My poor wife cringed as nearly ten seemingly endless minutes passed. Why didn't somebody from the bishopric stop the charade? Even many years later we still occasionally get comments about how charming our son was that day, although, charm is hardly the point of testimony meeting. I will never forget one fast Sunday as a kid when one middle aged sister in our congregation spoke. She had many admirable qualities, but physical beauty was not at that time among those traits. I can remember the blatant appalled look on my father's face after this sister said, "I just want you all to know that I have never knowingly enticed any man." Dad quickly regained his composure, but then leaned over and whispered to Mom, "Never unknowingly either." Which earned him an elbow jab to the ribs. After relating tales from one particularly tedious testimony meeting, a friend that currently serves in a stake leadership position wondered aloud why the Brethren (Mormon code phrase for top church leaders) didn't just put the kybosh on Open Mic Sunday. I believe that he overstates the challenges of the testimony meeting format. But church leaders obviously recognize some problems, since they issue directives like this 2013 letter every few years encouraging improved management of these meetings. It is even possible that the testimony meeting glitches serve a worthwhile purpose. Stephen E. Robinson has reminded us that the church is filled with imperfect people that are prone to acting like "boneheads," and that each of us occasionally plays the part of the bonehead. If the Savior was willing to sacrifice himself for all of these boneheads (including us), perhaps he has a right to ask us to exercise some patience in dealing with the frailties of our fellow church members. Indeed, graciously suffering through others' mistakes may be among the most Christ-like things we could ever do. Another distinct possibility is that the Brethren have carefully considered the matter and have determined that the pros of holding fast and testimony meetings outweigh the cons. Our meeting this past Sunday might provide evidence of such a positive cost-benefit analysis. Among the many high quality witnesses that were spoken that day, one sister that was visiting our congregation got up, probably because many of her family members were present. I knew that this sister had been through some rough years but had turned her life around. She began by saying, "I have been a member of this church since I was a child, but I became a convert to the gospel of Jesus Christ two years ago." The following two minutes were powerful in their simplicity. I'm not sure that it is possible to adequately explain to someone how the Holy Ghost feels. It certainly isn't simple emotionalism, although, many have leveled such accusations. It is probably like trying to explain the taste of salt someone that has never tasted salt. Dr. Daniel Peterson says that while revelation from the Holy Ghost is "nontransferable," the methodology that leads to personal spiritual encounters (see Moroni 10:4-5) "is proportioned to the needs and capacities of all and is not restricted to a specially trained ... elite." I believe that the testimony meeting format lends itself particularly well to opportunities for experiencing this kind of spiritual communion. When I begin to find a testimony meeting wearisome or when I begin to overly focus on the meeting's flaws, it is likely that I am choosing to erect barriers to the witness that the Holy Ghost is willing to give me. I hope that I will continue to cherish fast and testimony meetings throughout my life, complete with their imperfections.